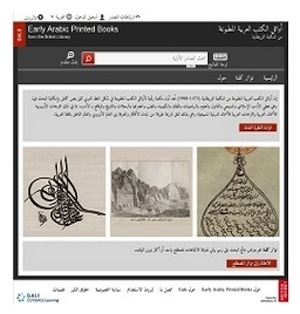 Educational publishing company Gale is getting off the ground with a new multi-year project to digitize Arabic primary sources and reference materials. The firm, which is part of Cengage Learning, anticipates converting "millions of pages" of rare and precious Arabic language collections that are maintained in multiple institutions in the Middle East and elsewhere. The company will support the materials with a digital research environment and online tools. "This program is a game-changer. Not only will it help preserve Arabic heritage in the Middle East and Islamic studies, it will transform the historical and cultural study of the Middle East," said Paul Gazzolo, senior vice president and general manager. Added Nicholas Berg, head of strategic marketing for research solutions, "None of our competitors have attempted a scholarly mass digitization program of this scale before." The project's first offering will be a collection of printed books from the 15th through 19th centuries from the British Library. That's expected to be available in December. According to Gale, this will be the first major searchable online archive of pre-20th century Arabic printed books available anywhere. Subsequent materials from the collection will be released in 2016 and 2017. "Ranging across a wealth of topics--from Islamic literature to law and the sciences — the collection will contribute significantly to a deeper and multi-faceted understanding of the Arab world," said Simon Bell, head of publisher relations at the British Library. "This is without doubt a major publishing event that represents the first large-scale digitization of searchable early Arabic books for scholars worldwide." The company said scholars would be able to search full text items in Arabic, English, French, German, Latin, Italian, Dutch and Spanish and "discover" content in Greek, Hebrew, Hindi, Ottoman Turkish, Persian, Syriac and 17 other languages. The work includes developing interfaces for both Arabic and European languages, right-to-left-read navigation of Arabic texts, an embedded Arabic keyboard and newly-developed optical character recognition software for early Arabic printed script. The product team at Gale is working with an advisory board of researchers from New York University, the University of Cambridge, the Institute for Palestine Studies and McGill University, among others.